PeacePower: Was Gandhi an Anarchist? Anarchy is about abolishing hierarchy. According to the original, Greek meaning of the word, Anarchy stands to create a world where there is no separation between the rulers and the ruled--a place where everyone rules themselves. (An-archy in Greek means without rulers.) An anarchic vision of society is nonviolent, self-managed and non-hierarchical, and Anarchist thinkers hold dear to the ideal of democracy--rule by the people. They suggest political confederations of local organizations; a "commune of communes" was how the 19th century Parisians Anarchists articulated it. Anarchists seek to dissolve power instead of seize it. Therefore, they seek a social revolution instead of a political one. The social revolution throws into question all aspects of social life including family organization, schooling, religion, crime and punishment, technology, political organization, patriarchy, environmental concerns as well as others. 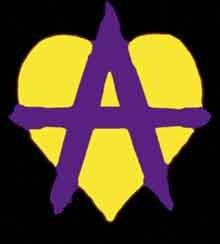 Anarchists are identified "as enemies of the State," because they do oppose the existence of a hierarchical, top-down State. 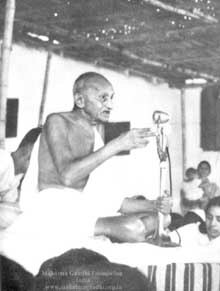 According to Dr. Dhawan, Gandhi was a philosophical Anarchist because he believed that the "[the greatest good of all] can be realized only in the classless, stateless democracy. "2 While Gandhi advocated democracy, he differentiated between direct democracy and western democracy. Commenting on the parliamentary system, Gandhi says, "If India copies England, it is my firm conviction that she will be ruined. Parliaments are merely emblems of slavery. "3 He had no more appetite for majority democracy of America, "It is a superstition and an ungodly thing to believe that an act of a majority binds a minority. "4 By centralizing power, western democracies feed into violence. Thus, he thought decentralization was the key to world peace. In Gandhi's view all the political power that was concentrated in the State apparatus could be dissolved down to every last individual. He stated "Power resides in the people, they can use it at any time. "5 Reiterating the idea of Anarchy, Gandhi said, "In such a state (of affairs), everyone is his own rulers. He rules himself in such a manner that he is never a hindrance to his neighbor. "6 Gandhi had no illusions about the enormity of the task, but he took it on anyways. He believed that by reforming enough individuals and communities, society at large will change. 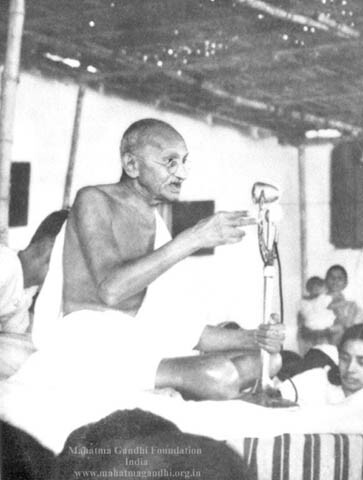 Gandhi's concept of swaraj elucidates the connection between the individual and society. "The individual has a soul, but as the State is a soulless machine, it can never be weaned from violence to which it owes its very existence." But Congress did not disband after independence in 1947. Gandhi recognized that there would be a national government, and his anarchic, oceanic circle would not yet be possible. Nevertheless, he used the terms of nationalism to move towards the ideal of Anarchy. He advocated for a minimal level of State organization to fund some education programs and to promote his economic concept of trusteeship. Hence, Gandhi was a compromising Anarchist. By trying to understand Gandhi's worldview, certain questions jump out with contemporary relevance. First off, what is our culturally appropriate "utopian" picture of America or of the communities in which we live? Secondly, what practical steps can we make towards swaraj amidst the current global empire? Finally, if Gandhi is right that all power resides in individuals, and that power is derived from an "indomitable will" than how do we reclaim the latent power within us, both individually and collectively? Bhattacharyya, Buddhadeva. Evolution of the Political Philosophy of Gandhi. Calcutta Book House: Calcutta, 1969. Jesudasan, Ignatius. A Gandhian Theology of Liberation. Gujarat Sahitya Prakash: Ananda India, 1987. Parel, Anthony (ed.) Gandhi: Hind Swaraj and other writings. Cambridge University Press: Cambridge, UK, 1997. 1 Jesudasan, Ignatius. A Gandhian Theology of Liberation. Gujarat Sahitya Prakash: Ananda India, 1987. pp. 236-237. 5 Jesudasan, Ignatius. A Gandhian Theology of Liberation. Gujarat Sahitya Prakash: Ananda India, 1987. pp. 251. 6 Murthy, Srinivasa. Mahatma Gandhi and Leo Tolstoy Letters. Long Beach Publications: Long Beach, 1987. p. 13. 7 Ibid. p. 112. 8 Ibid. p. 73. 9 Ibid. p. 41. 10 Ibid. p. 85. 11 Ibid. p. 189. 12 Murthy, Srinivasa. Mahatma Gandhi and Leo Tolstoy Letters. Long Beach Publications: Long Beach, 1987. p. 40. 13 Jesudasan, Ignatius. A Gandhian Theology of Liberation. Gujarat Sahitya Prakash: Ananda India, 1987. p. 225. 14 Parel, Anthony (ed.) Hind Swaraj and other writings of M.K. Gandhi. Cambridge University Press: Cambridge, UK, 1997. p. 77.